Identifying plumbing problems requires all five senses. Check the list below to see if you can recognize these familiar warning signs. Many problems can be identified by sight alone, like puddles or rust and corrosion signifying a leak or blockage. 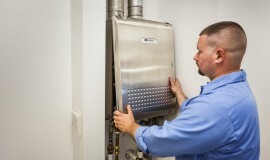 If you notice discoloration of your pipes and appliances, this could mean that it is time for a repair or replacement. Bad odors in the home can often be a red flag for plumbing problems. If you notice a bad odor escaping your toilet, it could be the result of a loose seal. A seal is meant to trap odors and lead them out of the house through a vent. If there is a bad smell coming from your kitchen sink, this could mean there is a blockage in either the drain or the vent. Low water pressure is one common plumbing problem that is easily identified through touch. This can be the sign of a range of problems, some easy to fix, like cleaning the aerator, and some that require more intensive plumbing repairs, like leaks and breaks. If water from the faucet tastes unusual, this could be the sign of something bigger. We urge you to contact us to have your water tested so you can be sure you are safe. Some plumbing problems cause sounds like gurgling and grinding or dripping and clanging should not be ignored. However, it is important to note that some noises, although disturbing, are not unusual, like the burners of a storage water heater kicking on and shutting off. If you are ever unsure of a plumbing sound in your home, don’t hesitate to call us so we can help!